One rarely considers how valuable clean, purified water is until they are in a third world country, hiking and in search of fresh water, or without electricity and a flowing supply of aqua. But for the 884 million people in the world that live without safe water to drink, becoming sick from a contaminated stream is a daily concern. Many third world countries suffer the burden of unclean water and pay drastically for the luxury easily taken for granted in developed nations. It is estimated that nearly one in five deaths (1.5 million) is due to diarrhea-related sicknesses that may stem from an unclean stream. In fact, according to LifeStraw, Diarrhea kills more young children than AIDS, malaria, and measles combined. This situation is tragic, but will be changed thanks to a new invention. 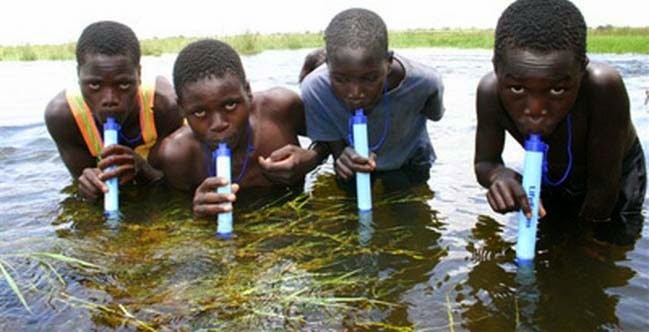 The LifeStraw, a 22 cm-long purification pipe, was originally developed by Danish manufacturers in 2005 as a solution to the devastating problem of unsafe drinking water in lesser developed countries. Because it is a tool that can save lives, it was named the Best Invention in 2005 by Time Magazine and Invention of the Century by Gizmag. In 2006 it was heralded by the New York Times as a ‘water purifier that could save lives’, and Forbes Magazine also labeled it as ‘one of the ten things that will change the way we live’. Just what does this extraordinary straw do? The LifeStraw can remove 99.9999 percent of water-born bacteria plus other parasites, including E-coli, campylobacter, vibrio cholerae, psuedomonas aeruginosa, shigella, and salmonella. It is capable of filtering at least 1,000 liters of water, and is simple to use. For those in locations where clean water is inaccessible, the invention is life changing. The video below demonstrates its practical capabilities. While most people wouldn’t consider drinking from the toilet, it is safe to use in such a location – an example of how marvelous an apparatus the LifeStraw is. If implemented in areas of the world where clean water is scarce, it is estimated diarrhea morbidity can be reduced by 40 percent. Because 1.8 million lives are lost due to unclean water every year, this device has extraordinary potential. Whether an avid hiker or a resident in an area with unclean water, the fear of contamination and sickness can be drastically reduced with the LifeStraw.